The High Jumping Dizzy Dysautonomia Frogs - Dysautonomia Youth Network of America, Inc. In among the willowy reeds and tall river grasses, if you look very, very carefully, you will find the obscure and mysterious High Jumping Dizzy Dysautonomia Frogs. High Jumping Dizzy Dysautonomia Frogs are kind hearted and gentle spirited little beings. They have pallid, translucent, soft skin and long, extendable limbs with quite flexible joints. They can jump to great heights. They are known to be exceptionally smart and remarkably talented. Most of them are females, but there are some adorable male High Jumping Dizzy Dysautonomia Frogs too. Sadly, High Jumping Dizzy Dysautonomia Frogs are afflicted with an unusual and not well understood medical condition. Sometimes, life can be rather difficult for High Jumping Dizzy Dysautonomia Frogs. These mysterious young creatures can not tolerate the heat very well and hopping around can make their little hearts go pitter pat and all that. They tucker out pretty easily and sometimes they flop down all over the place. The other frogs in the big pond don't understand them very well so the High Jumping Dizzy Dysautonomia Frogs always try to stick together. They often find themselves on great adventures in uncharted territory. 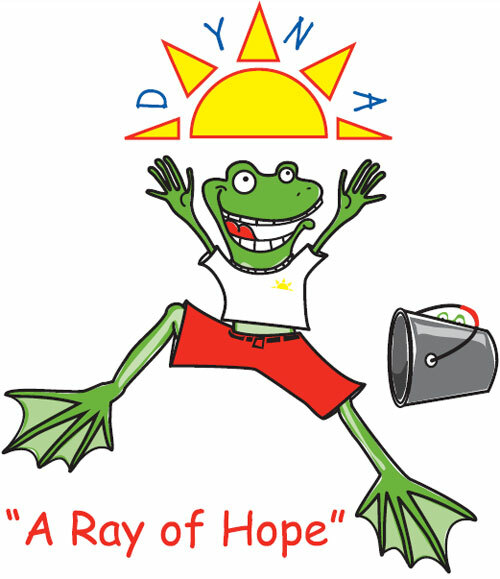 Thankfully, there is an organization called DYNA that supports the High Jumping Dizzy Dysautonomia Frogs. DYNA protects these unique frogs and tries to educate the world about them and their habitat. DYNA helps the others in the big pond understand that having an illness does not mean that you have a weakness. We are sure that you'll agree that, in fact, the High Jumping Dizzy Dysautonomia Frogs are actually amazingly strong and perseverant! DYNA has set aside a private safe little pond where the High Jumping Dizzy Dysautonomia Frogs can hang out together and hop and flop around all they want. High Jumping Dizzy Dysautonomia Frogs from big ponds all over the world travel to the little pond and feel very comfortable there. One hot sunny frog hopping day, one of the long limbed High Jumping Dizzy Dysautonomia Frogs noticed a barn near the little pond. "Let's venture out of our safe little world!" he said. Being a fearless and inquisitive group, all the High Jumping Dizzy Dysautonomia Frogs hopped towards the barn to investigate. Excitement radiated in the air and adrenalin pumped through their veins with great abundance. By the time the curious hoppers got there, they were parched from the heat, dehydrated, and very thirsty. They noticed a large vat of milk and decided that it would be great fun to swim in the milk (like they swim in their safe little pond), cool down and have a nice long drink. So, in to the vat they all leapt. For a few minutes they paddled about laughing and croaking joyfully while bobbing up and down and sipping the cool milk. Next thing they knew, the High Jumping Dizzy Dysautonomia Frogs became extremely tired and wanted to get out of the milk bucket to rest, but no matter how hard they jumped they couldn't escape its depths! Goodness me, those High Jumping Dizzy Dysautonomia Frogs were overwhelmed with fear! This adventure out of their safe little pond was not the fun they thought it would be! Some of the frogs became extremely weak and dizzy. The stronger frogs kicked their legs, kept afloat and held on tight to their weaker, tired friends. Miraculously, together, they all somehow managed to keep above the surface. They kicked and jumped and hopped as well and as high as they could. They stuck together and would not give up! "Keep hopping! Don't give up!" shouted the stronger more experienced High Jumping Dizzy Dysautonomia Frogs. So they did. The High Jumping Dizzy Dysautonomia Frogs kept hopping and jumping and paddling and kicking even though they wanted to give up. When one of the frogs was struggling, the others helped. When a tired frog fell to the bottom of the vat, the others pulled him back up again. When the weakest frogs were ready to give up, they saw how the stronger frogs were persevering, and that gave them all strength. They couldn't and wouldn't give up. Never ever! For what seemed like forever, those High Jumping Dizzy Dysautonomia Frogs jumped and paddled with all their might. Eventually their hard work and determination paid off. They had jumped so high and paddled so hard and kicked for so long, that they had turned that darn vat full of milk into a lovely vat of thick, smooth butter! Gently they floated on the surface and stopped struggling so hard to stay afloat. After a long while, one by one, they were able to take one big jump out of the vat, until they were all safe and happy on solid ground again. Back at their safe little pond, lying in the willowy reeds and tall river grasses, the High Jumping Dizzy Dysautonomia Frogs knew from that point on, that if they worked together, they could achieve anything! Don't give up hope and never stop hopping!